In the larger sense, global warming has continued unabated in the recent period: Ocean heat accumulation, sea level rise and polar ice cap melt all continued inexorably. And the muti-decadal record in surface temperatures shows no evidence of significant change or slowdown in recent years. 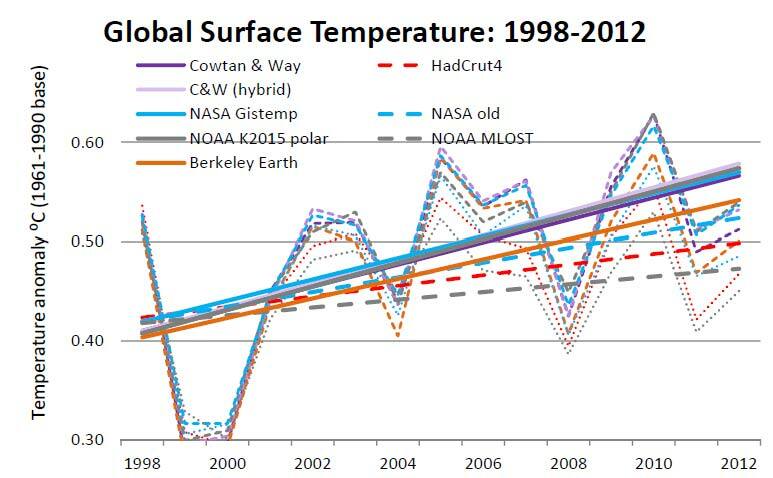 Nevertheless, the short-term trend in global means surface temperature has been somewhat lower than the multi-decadal trend in GMST data sets. At the time of the release of the latest IPCC report in early 2013, there were three main global surface temperature series: HadCrut4 (from the UK MetOffice Hadley Centre in partnership with the UEA Climatic Research Unit), NOAA MLOST and NASA Gistemp. Of these only NASA GisTemp used extensive interpolation to estimate temperatures in regions without observations. (NOAA does have limited interpolation, but does not estimate temperature in missing areas in polar regions). Thus, HadCRUT implicitly assumes that areas without observations have a temperature anomaly equal to the hemispheric mean anomaly. Given the pattern of large temperature anomalies in the fringe Arctic areas with data … this implicit estimate surely understates the effect of Arctic temperature anomalies. In the runup to the IPCC AR5 2013 report, a new version of HadCrut featured enhanced station coverage in the Arctic, as well as an improved sea surface temperature data analysis. HadCrut4 did bring recent trends closer to NASA GisTemp, but still left a “hole” in the Arctic (albeit a smaller one). AR5 reported that 15-year trend for 1998-2012 was 0.05 ± 0.1 ºC per decade, much lower than the multi-decadal trend. In the two years following the release of AR5, the three traditional series were supplemented by two interpolating analyses from Cowtan and Way and Berkeley Earth. Cowtan and Way’s original 2013 “hybrid” method used the satellite-based lower troposphere temperature record from UAH to fill in areas missed by HadCrut4, and also used a statistical interpolation technique known as kriging to estimate an average temperature “field” (thus filling any remaining gaps). However, the original Cowtan and Way series only covered the satellite era (since 1979). So in early 2014, Cowtan and Way introduced a new “long” series back to 1850, with a “pure” krige interpolation of the complete HadCrut record. Soon after, the Berkeley Earth group released its new global temperature series based on combining the existing Berkeley land record with the ocean surface temperature data set from the Met Office Hadley Centre (i.e. the ocean component of HadCrut). When smoothed to reflect multi-decadal variability, all five series showed a steady rise over the last 40 years with no slowdown, following a relatively flat period from 1940-1970. To be sure, there is some divergence even at the multi-decadal level. The three series that used interpolation to estimate regions with missing observations and provide complete global coverage (Cowtan & Way, Berkeley Earth and NASA) had a slightly higher trend over the last few decades than the two others (HadCrut4 and NOAA). But if we turn to shorter time periods and examine decadal variability, we can see that there was an apparent slowdown starting around 2000 (as well as some more pronounced wiggles earlier on). Although all five series showed a positive rise over the last 15 years, the three fully interpolated series had much less of a bend compared to the flatter recent trend in HadCrut4 and NOAA MLOST. This discrepancy reflects coverage bias in the latter two series. 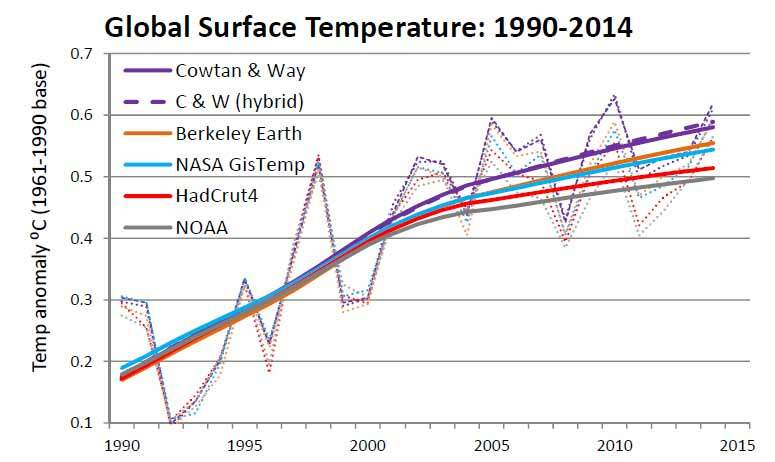 Let’s take a closer look at the evolution of global temperature in those series, including both the “hybrid” and main “long” Cowtan and Way series (the “hybrid” series has been rebaselined to match the main series over 1979-2000). Cowtan and Way, Berkeley Earth and NASA Gistemp all use interpolation (and supplementary data in the case of the Cowtan and Way “hybrid” series) to estimate missing areas, including crucial land and sea ice regions in the Arctic. Arctic and Antarctic polar areas beyond 65⁰ latitude represent only about 9 percent of the Earth’s total surface area. Nevertheless, the recent rapid Arctic warming had a noticeable impact on the recent evolution of global surface temperature starting around 2000, partly offsetting relatively static ocean temperatures. Earlier this year, Karl et al released a landmark study that featured several enhancements to the NOAA analysis. The most important of these was incorporation of the improved ERSSTv4 sea surface temperature set, which corrected for biases due to differing measurement techniques. HadCrut4 had already included similar corrections across the 20th century record, but NOAA’s ERSSTv4 went further in addressing potential bias from the changing mix of buoy and ship measurements over the last decade or two. Karl et al also incorporated a much larger land station data set from the International Surface Temperature Initiative (ISTI), thus improving station coverage. In addition to the main analysis, Karl et al also published an experimental polar interpolation series. It is important to note, however, that only the new SST data set has been incorporated into the NOAA operational global temperature series (now dubbed NOAA GlobalTemp). The land station set remains the traditional Global Historical Climate Network (GHCN), which is planned to be replaced by ISTI in 2016. NASA Gistemp also relies on the NOAA SST data set, so it too has been updated operationally. 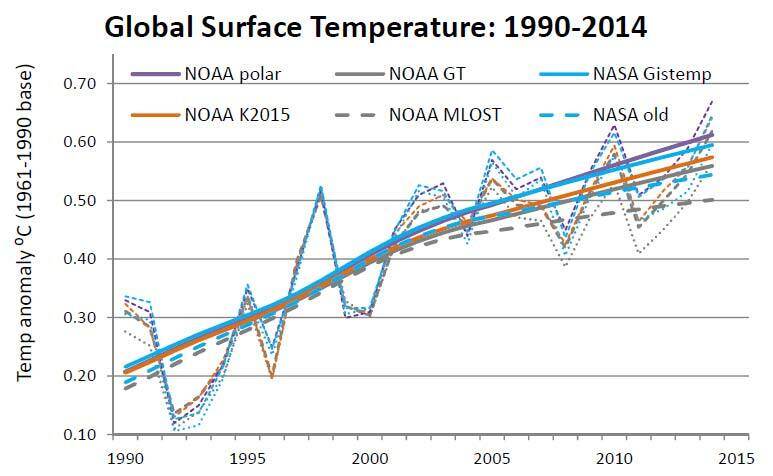 The following chart compares the Karl et al 2015 series and the new operational NOAA and NASA series (solid lines) with the previous operational versions (dotted lines). NASA still has a higher recent trend than NOAA (due to polar interpolation), but both are noticeably warmer than the previous versions. The experimental NOAA “polar” series is highest of all, giving some indication of where NASA might end up once an expanded land station data set is incorporated operationally. A different view of these same six series shows the effect of coverage bias more clearly. Each same coloured pair (for example NASA Gistemp and NOAA GlobalTemp) can be thought of as representing more or less the same underlying station and SST data, with the solid lines representing a polar interpolated average, and the dotted lines the corresponding series with little or no interpolation. Until recently, HadCrut was considered the primary of the three established surface temperature analyses, in large part because it was more complete, stretching back to 1850 (NOAA and NASA both start in 1880), and also has a more comprehensive error model. Some key IPCC analyses rely mainly (or even solely) on HadCrut. But now a re-evaluation of the IPCC AR5 assessment of recent trends and associated model-observation comparisons is possible in light of the newer temperature series. In particular, IPCC AR5 chapter 9 defined the recent slowdown as a “hiatus” characterized by a much smaller trend since 1998, compared to longer periods (and also did not note the very large statistical uncertainty of the short-term trends). 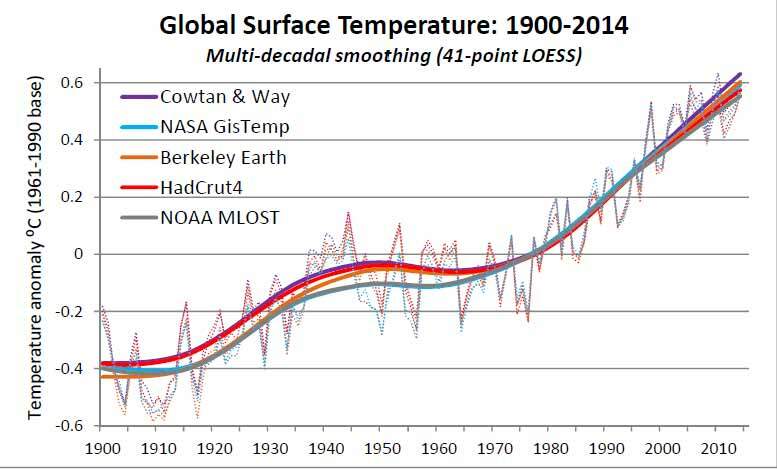 However, adding the new interpolated global temperature series paints a very different picture. As the following table makes abundantly clear, the supposed marked contrast between the 1951-2012 and 1998-2012 linear trends is now very much in question. In fact, the newer series show almost no difference between the 60-year trend and 15-year trend to 2012. The following charts summarize the above in a more digestable form. The 1998-2012 trends of all the updated fully interpolated series are clustered about 0.1⁰C per decade, double the average reported by the IPCC. We can also compare the IPCC spread to the updated operational series (Cowtan and Way now update their series every month, adding a fourth series to the three established ones). The short-term trend in HadCrut4 is noticeably lower than the other three. To be sure, AR5 chapter 2 on observations was careful to note that 15-year linear trends have very wide confidence intervals and can reflect large swings in short-term natural variability. And they are very sensitive to even small changes in starting point: beginning in 1997 (or 1999) raises the assessed trend considerably in all series, further demonstrating that little importance can be ascribed to such very short term trends. To overcome these and other limitations of linear trends, AR5 chapter 2 suggested the use of non-linear trend estimation techniques. Such approaches generally use a smoothed regression to evaluate temperature evolution over intervals of interest, and as pointed out in AR5, these can offer considerable advantages in characterizing variability. AR5 gave some limited examples in Chapter 2 (Observations in the Atmospheres), using a smoothed spline approach. LOESS (local estimation) regression is also a viable option and so we can generate reasonable preliminary estimates by deriving trends from the decadal smoothing shown above. In this case, only approximate uncertainties have been indicated; these tend to be in the neighbourhood of about two-thirds the linear trend case. (I will be treating the topic of uncertainty in trend estimates in detail in future posts). In all cases, the slowdown over 1998-2012 is less pronounced than suggested by a simplistic linear trend. In fact none of the assessed trends are lower over 1998-2012 than 1951-2012, casting further doubt on the AR5 Chapter 9 definition of the “hiatus”. However, the effect of coverage bias still can be discerned, albeit somewhat less pronounced. To sum up, coverage bias has a notable effect on the evaluation of recent surface temperature trends, especially conventional linear trends. At the time of IPCC AR5 report there was limited awareness of the full implications of coverage bias. As a result, the “hiatus” discussion in AR5 chapter 9, and cited studies such as Fyfe et al 2013, relied on a HadCrut4 temperature series that had only partially mitigated the issue. The term “hiatus” has entered the climate science lexicon, even though the original definition is problematic. If that descriptor is to be retained, it needs to be clearly understood as referring to a moderate, short-term slowdown relative to the multi-decadal trend, not a severe reduction in the rate of GMST increase (much less a “stop” – temporary or not – in global temperature increase). Fortunately there are clear signs that the MetOffice will soon address the coverage bias issue. Dodd et al (2015), including HadCrut lead scientist Colin Morice as co-author, confirms that interpolation (especially kriging) provides superior estimates of Arctic surface temperature than the current HadCrut method of averaging non-empty grid cells and ignoring empty areas (“binning”). In addition, the HadCrut hemispheric averaging underweights an already suboptimal Arctic estimate; in fact, as I will show in a subsequent post, about half of the discrepancy between HadCrut4 and Cowtan and Way is down to the current simplistic averaging scheme and the other half to lack of interpolation per se. Splitting the globe into four zones rather than two hemispheres gives more appropriate weight to polar regions beyond latitude 65 , yielding a 1998-2012 trend estimate of ~0.08C per decade, instead of ~0.05. Nevertheless, the HadCrut team is to be commended for making a special effort to add station coverage in the far North, which has already partially mitigated coverage bias, and will provide an improved temperature record going forward. In an interview and follow up with Carbon Brief earlier this year, MetOffice chief scientist Julia Slingo all but confirmed that the next major version of HadCrut will address the data gaps via some form of interpolation or optimal averaging, as well as further data “rescue”. A paper by Cowtan & Way came up with a solution for filling in the well-known gaps in HadCrut4, particularly in the Arctic. Will the Met Office be implementing the same approach? Slingo’s commentary is also notable for referring to very recent temperature evolution as a slowdown, not a “pause” or “hiatus”. That pattern continued in a recent MetOffice analysis that added to the growing scientific consensus that the slowdown may well have ended, as a huge El Nino continued to develop, while the Pacific Decadal Oscillation appears to have flipped from negative to positive phase. Incomplete and non-uniform observational coverage of the globe is a prominent source of uncertainty in instrumental records of global near-surface temperature change. In this study the capabilities of a range of statistical analysis methods are assessed in producing improved estimates of global near-surface temperature change since the mid 19th century for observational coverage in the HadCRUT4 data set. Methods used include those that interpolate according to local correlation structure (kriging) and reduced space methods that learn large-scale temperature patterns. Although enhancements to the recent instrumental record will be most welcome, MetOffice research on the earlier part of that record may prove yet more valuable. The Cowtan and Way and Berkeley Earth analyses suggest that overall warming since the 19th century has been about 10% higher than suggested by the current HadCrut4 analysis. 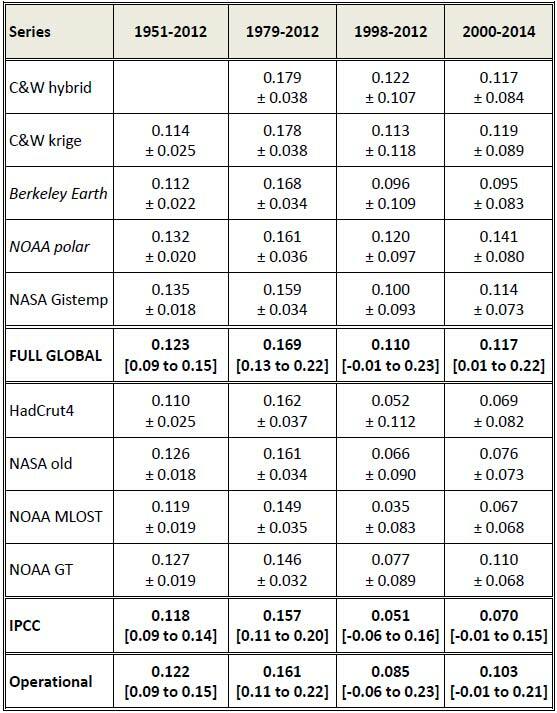 Revised estimates of the earlier period, and even more crucially, full uncertainty estimates, will no doubt better inform observationally constrained estimates of climate sensitivity. None of this is to say that the recent moderate short-term slowdown in GMST was completely spurious or an unworthy subject for scientific examination. Already, studies have addressed apparent discrepancies between model projections and observations, in light of recent improved understanding of the observational record as well as other factors affecting climate evolution. As I will show in subsequent posts, the most compelling of these find little evidence of model-observation divergence beyond what would be expected from internal natural variation, so long as there is a proper accounting of coverage bias and updated forcings. Meanwhile, the current strong rise in all the surface temperature records is also characterized by increasing convergence between the various operational data sets, coverage bias or no. I will look at this phenomenon in part 2 in a short while, but for now, I will end with a preliminary look at the recent evolution of the four major operational series (all except Cowtan and Way are updated to the end of 2015). All the analyses agree: it’s getting very warm and 2015 was by far the warmest year in the instrumental record. This entry was posted in Climate science, surface temperature and tagged coverage bias, Cowtan and Way. Bookmark the permalink. The link for, paper at the recent AGU conference, is not working. Thanks for reading to the end! The link has been fixed now. I quibble some with the phrase in the lead paragraph’s 2nd sentence, “without any assist from the El Nino weather pattern that usually accompanies such warm years.” According to a graph in a Weather Underground article released today (by Jeff Masters and Bob Henson), a couple of months in 2014 had “conditions similar to El Niño”. At least one agency declared that an El Niño started in 2014, but a resetting of the ‘average background’ (or something like that) reversed the declaration. (This ‘average background’ keeps going up due to AGW, of course.) I’d rather have seen you use a phrase similar to “without a full-blown El Nino, the weather pattern that usually accompanies such warm years.” This said, your article focuses on coverage bias and what scientists have been doing to see what is happening more clearly, so my ‘quibble’ is not relevant to your main thesis. Actually, I think the “resetting” was the change in ERSST from v3 to v4. Be that as it may, it’s true that ONI was in El Nino territory (ONI >= 0.5) for the last couple of months of 2014. But it was in La Nina-ish (ONI <= -0.5) early on, and overall ONI was 0 for the year. Not only that, but global temperature usually lags ENSO by 3-4 months, and the last 3 months of 2013 saw a slightly negative ONI. So on balance I would say there was very little if any overall ENSO effect in 2014. 2015 definitely received a boost (like 1997), but the full effect should only be reached this year (as in 1998). DC, has anyone tried applying coverage bias to model output? i.e. remove temperature records where we can’t measure them on the surface, and fill in the blanks with the same methods they’ve used with surface data. Cowtan and Way cross-validated in a number of ways, including reanalyses. Morice et al from the UK Metoffice have validated their new methodologies against CMIP5 model output (see AGU abstract above). As far as I know, they are the first to do this. Nice to see you posting again, DC. As 1998 moves down the list of hottest years, it gets harder to claim that “global warming stopped in 1998.” But I expect the meme to continue for a while yet. It was obvious to anyone who was even slightly statistically savvy that the hiatus was likely due to statistical variability and when Cowtan and Way showed the underestimate of Arctic warming much of that disappeared too. The increasingly warm western Pacific (exemplified by Typhoon Haiyan) largely explained where the extra heat was going. So it’s no surprise that we now have a super El Nino and the record world surface temperatures. As the greenhouse gas forcing was increasing, how could the temperature stop rising? Events in the Arctic, especially the melts in 2007, 2010, 2011, and 2012 showed the effects of continued warming. I wonder what we’ll see there in 2016 and, particularly, 2017, when this El Nino heat gets into the Arctic. Syd Bridges: Repeat after me… “Global Warming stopped in 2016.” That is the new mantra. DC: I’m just curious to see what the data sets looked like, and I think it would be interesting to observe what the model output looks like if we introduced observation bias. I had seen a one model output with the poles removed and they had a decidedly flat hiatus in them.